GRAND FORKS – Sponsored by The University of North Dakota and led by UND’s Head Swimming Coach Chris Maiello and Assistant Coach Anthony Harris, the North Dakota Swim Camp is a stroke technique intensive camp. It is designed to help a swimmer improve efficiency in each of the four individual strokes including starts and turns. One stroke will be highlighted each day, with a day reserved for starts and turns. The Camp is open to ages 9-18. Instruction will occur in two of the three daily sessions, where swimmers will receive individual instruction. The third session is an optional training session. Campers will also receive daily instruction in dryland, goal setting and nutrition to help campers become well rounded athletes. The Camp is held at the Hyslop Sports Center. The Hyslop is home to a 50-meter training facility that will be set up in two 25-yard pools for camp. Underwater video of each camper will be shot and analyzed by the camp staff. Campers will be divided into Green and White teams for evening activities including, Water Wars, Scavenger Hunts, UND Olympics and Swimming History Trivia, as well as other camp-orientated programs. The North Dakota Swim Camp has three options to choose from: resident, commuter, and AM only. Campers will be under constant and professional supervision throughout their stay. A wide range of useful information will be offered throughout each day to campers. Therefore, we recommend that each camper bring a notepad and pen. A Double Session stay will include planned weekend activities with supervision and meals. 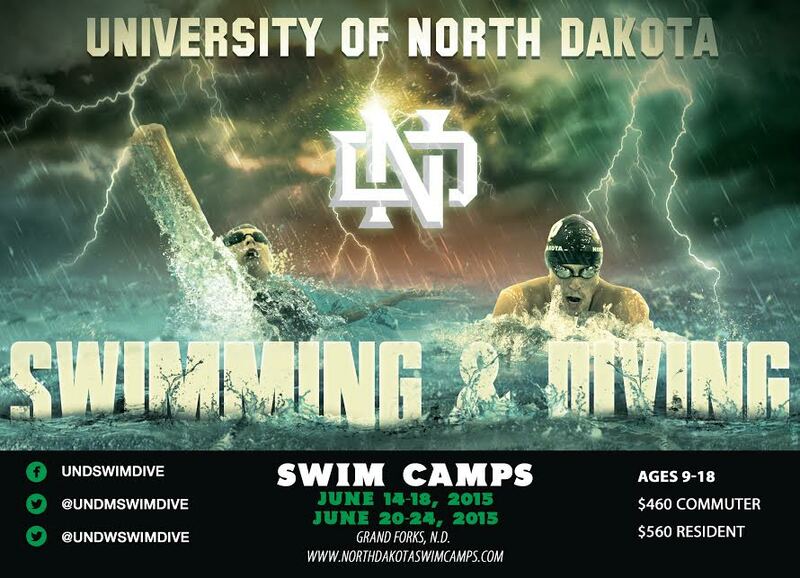 Complete camp information and online registration available at www.northdakotaswimcamps.com.